The cyber threats facing today’s organizations are more sophisticated than ever before. 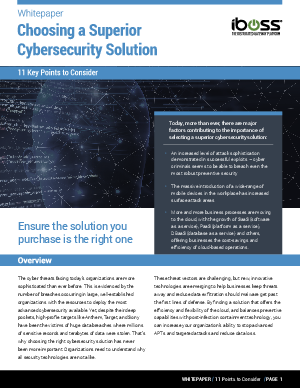 This is evidenced by the number of breaches occurring in large, well-established organizations with the resources to deploy the most advanced cybersecurity available. Yet, despite their deep pockets, high-profile targets like Anthem, Target, and Sony have been the victims of huge data breaches where millions of sensitive records and terabytes of data were stolen. That’s why choosing the right cybersecurity solution has never been more important. Organizations need to understand why all security technologies are not alike.